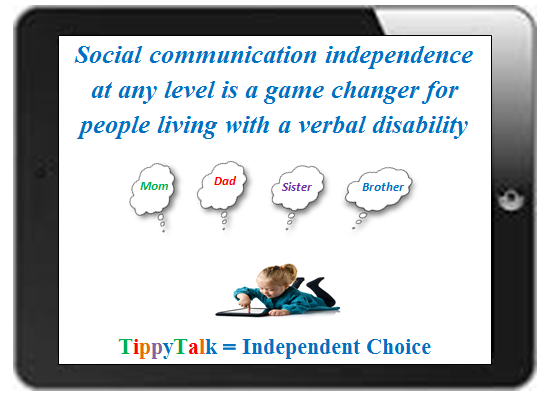 Social inclusion and independent choice when it comes to communication would be the ultimate success for our TippyTalk community. However Children and adults on the spectrum or any person who is living with a verbal disability will have different points of personal success and achievements when it comes to integrating TippyTalk into their lives. For my family, success began with the ease of which TippyTalk replaced the Picture Exchange Communication System, PECS for short. My wife and I would spend hours every Sunday night replacing pictures that were lost or damaged. We would have to download and laminate them to insure Sadie would be ready for the coming week; this can become expensive over time and extremely time consuming. This process was not always successful and sometimes we would somehow overlook a certain picture, which often led to frustration for Sadie. TippyTalk solved this issue and allowed for the personalization of the pictures being used, moving away from the generic pictures provided by the companies. We can now capture images which are uniquely identifiable to Sadie, and her individual needs, wants, desires, and emotions. These personalized pictures of places, people, belongings and toys were instantly recognisable to Sadie, this peaked her interest and curiosity, leading to her interacting with TippyTalk. The first day of Sadie interacting with TippyTalk I started to receive texts messages. At the beginning they didn’t make sense, she was just choosing random pictures from the screen. On the second day however my family experienced our first successful independent communication from Sadie. "HI DADDY CAN I HAVE CHICKEN NUGGETS"
I immediately phoned my wife to ask who sent the message; she replied it had to be Sadie since it was only the two of them in the house at the time. Needless to say this was a hugely emotional experience for my family, this was the equivalent of hearing my child’s first words and I didn’t even have to be in the room to experience it. I can honestly say I was the happiest father in the world to ever buy chicken nuggets for his child. Every parent wants to know when their child feels happy or excited, when they feel unwell, hurt or sad. Before the introduction of TippyTalk into our lives this process of trying to solve which emotion Sadie was experiencing and why was just a guessing game at times. On around week four of using TippyTalk this changed. We received our first texts message from Sadie where she communicated independently how she was feeling. She had been out in the backyard playing when she came running into the house; she immediately went over to TippyTalk and sent a message. I was sitting in the living room and received the message saying “Hi Daddy I am Happy “when I looked around Sadie was jumping up and down on the couch with this amazing smile on her face. This was the first time I can say without a doubt I knew exactly how my child was feeling, and since that day Sadie has expressed every type of emotion. I can say with confidence that with the introduction of TippyTalk into Sadie’s life and our commitment as a family to ensure success, we have experienced a reduction in Sadie’s frustration and angry outburst. Sadie still has her moments as do we all, the difference now however, is that Sadie has a pathway to communicate how she feels. My wife came home and in a matter of minutes Sadie relaxed. This was huge, how often have you been in a room with someone who was causing your frustration and you could simply just ask them to leave or just leave yourself. People who are non-verbal don’t have this choice, imagine being stuck with the one person who is causing the issues and having no way of telling them to go away, leave me alone, or sometimes that you just want your Mammy. None of the above successes would have been possible if it was not for the fact that TippyTalk itself is extremely user friendly. The person living with the verbal disability just has to touch 3 pictures from the screen for the independent communication to begin. You simply take a picture or download one and attach the appropriate text.